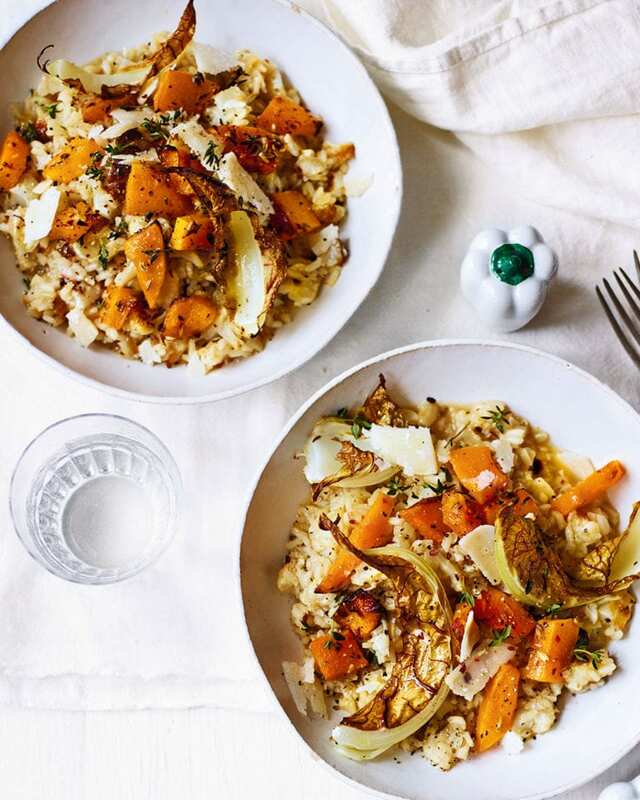 Our spiced butternut squash and cauliflower risotto is low in saturated fat making it a healthier choice on a weeknight. Looking for something else? You can discover more vegetarian risotto recipes here. Heat the oven to 200°C/180°C fan/gas 6. Put the squash in one side of a large roasting tin and the cauliflower florets in the other. Drizzle with 1 tbsp oil, then add the thyme, chilli flakes, fennel seeds and some salt and pepper. Roast for 40 minutes, tossing halfway through. Add the cauliflower leaves for the final 5 minutes of the cooking time, tossing them in the oil to coat. Cook until the vegetables are just tender and lightly charred. Meanwhile, heat the remaining ½ tbsp oil in an ovenproof saucepan or flameproof casserole over a medium heat. Cook the onion for 5 minutes until lightly golden, add the garlic, mix well for 1 minute, then stir in the rice. Add the hot stock and transfer to the oven for 20-30 minutes until the liquid has been absorbed and the rice is tender. Stir the roast vegetables into the rice along with the cheese. Taste and season, then serve.